The other day, I saw a couple people pushing shopping carts full of recyclables (beer and wine bottles removed from other's recyling bins) down the street at 6 am or so. What a racket! I remembered an idea I had for a wagon of sorts, which I combined the usefulness of a shopping cart and the speed of a sled and voila, the Binner's Cart 2.0! 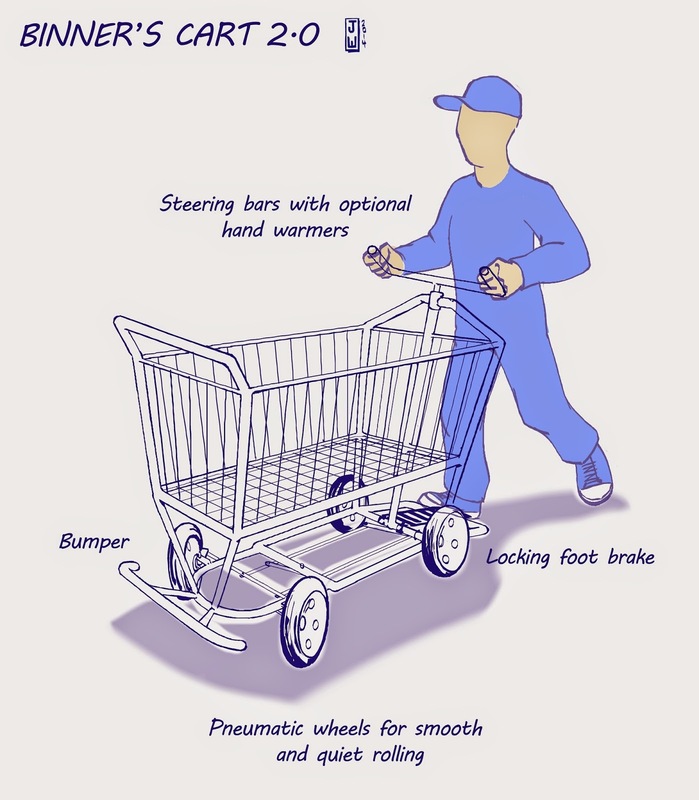 It's meant to be driven as mushers ride their sleds that are pulled by dog teams; stand on the back platform and kick the cart forward with your trailing leg. There is a locking foot brake on that platform and you steer by turning the steering bar. All models are constructed with high-strength, lightweight space age aluminum and yes, the LX model comes with hand warmers, ShurDry AC power outlets to charge cell phones and run radios to make that early morning work more pleasant! The wheels come with standard non-marking rubber tires and high pressure inner tubes to soften the ride and make the cart quieter. Spares and accessories (lights, reflectors, air horns) are available. Just what every Binner needs, all for the low, low price of $999.98 CND, tax import fees, and shipping not included. That's a lot of bottles!